Arizona — This Fourth of July weekend, it will be more important than ever for motorists in Arizona to adhere to the State’s Move Over law. Arizona's Move Over law is a measure designed to protect the lives of everyone who uses our roadways. ***Updated*** by Raul Garcia, Public Information Officer, on July 11, 2016, at 11:25 p.m.
None of the nine occupants were properly restrained and many of them were ejected from the SUV during the roll-over crash. 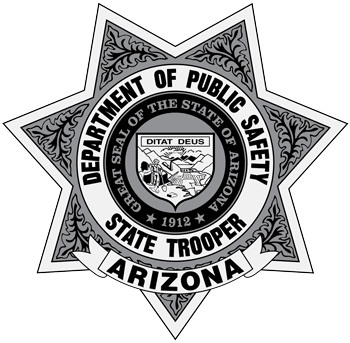 Arizona — The Department of Public Safety (DPS) launched a week long safety enforcement campaign leading up to the Independence Holiday weekend. Phoenix, Ariz. - From July 18th through July 30th, the Arizona Department of Public Safety (AZDPS) Commercial Vehicle Enforcement (CVE) will be taking part in a national Passenger Carrier Safety Initiative. ***Updated at 9:51 a.m., on July 27, 2016. Mesa, Ariz. — An Arizona Department of Public Safety (AZ DPS) Trooper stopped a driver along State Route 202 at Brown Road for criminal speed. The trooper had measured the vehicle’s speed with radar at 95 MPH in a 65 MPH zone. Phoenix, Ariz. — A man was arrested for excessive speed after he chased a trooper in his fully marked police car at 90 MPH on US 60. Cochise County, Ariz. — Video recorded by a commercial truck driver captured a horrific chain of events in which a passenger car collided into the side of a mountain and then violently rolled-over into the path of Interstate 10 traffic near Benson.